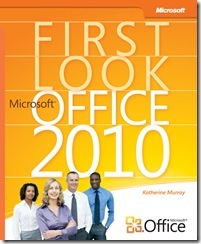 In effort to encourage more users in exploring the latest Microsoft Office 2010, where Office 2010 Beta is now available for free download, Microsoft press is now giving away “First Look: Microsoft Office 2010” digital e-book in PDF format for a limited time. The contents of the e-book are extracted from the early content of 14 chapters written by Katherine Murray. Part I: Envision the Possibilities – introduces the changes in Office 2010 and shows how can make the most of the new features to fit the way of work today. Part II: Hit the Ground Running – focuses on each of the Office 2010 applications in turn, spotlighting the key new features and showing how they relate to the whole. Part IV: Next Steps with Office 2010 – zooms up to the big picture and provides examples to help the users to think through interoperability. Chapter 1 – Welcome to Office 2010. Chapter 2 – Express Yourself Effectively and Efficiently. Chapter 3 – Collaborate in the Office and Around the World. Chapter 4 – Create and Share Compelling Documents with Word 2010. Chapter 5 – Create Smart Data Insights with Excel 2010. Chapter 6 – Manage Rich Communications with Outlook 2010. Chapter 7 – Produce Dynamic Presentations with PowerPoint 2010. Chapter 8 – Organize, Store, and Share Ideas with OneNote 2010. Chapter 9 – Collaborate Effectively with SharePoint Workspace 2010. Chapter 10 – Create Effective Marketing Materials with Publisher 2010. Chapter 11 – Make Sense of Your Data with Access 2010. Chapter 12 – Putting It All Together. Chapter 13 – Security in Office 2010. Chapter 14 – Training Made Easy.